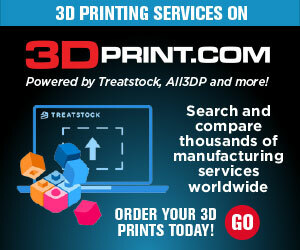 This week’s 3D printing stories we didn’t cover run the gamut from quite serious to whimsical, beginning with serious news of an MIT student’s use of 3D printing to document his brain tumor diagnosis and treatment, to a new Minecraft-inspired 3D design app, more Ultimaker files released, Taiwan’s new Fab Trucks, an Instructable for a homemade 3D scanner, and fun printed fashion and food news, too. Steven Keating, an MIT doctoral student in the Mediated Matter Group, used 3D printing to document his experience during the diagnosis and treatment of a tennis ball-size brain tumor. Keating’s experience and background in data management and additive manufacturing was used to create digital and 3D printed models of his tumor, brain, and skull surgery. Not only did he intend to share important medical knowledge with people in similar situations, but he also wanted to show how 3D printing can help people take charge and be centrally involved in their own medical treatment. And he did just this. His surgery was videotaped and he’s advocating an open approach to usually private medical information in the spirit of collaboration, with 3D printing centrally involved. A Minecraft inspired UNTITLED Creator app created by Thailand-based Treebuild makes 3D design more fun and user-friendly at the same time. You can use the LUBAS app to make pixelated artwork while also nostalgically indulging in Minecraft-esque imagery. Even better is that you can easily export your designs or choose to save the work into STL, OBJ, X3D, 3DDOM, HTML, or VRML. You can also send them to a 3D printing service that can print the design and ship them to your doorstep. We covered its beta release last month, and now the app is up and running. 3D printer manufacturer Ultimaker has gone out of its way to facilitate its customers’ central involvement in the making and upgrading of their 3D printers. The company continues to show its commitment to the open source movement and the maker spirit, recently launching its Ultimaker Original+ and Ultimaker heated bed upgrade files, which you can access on GitHub. Printer manuals, assembly instructions, and mechanics are all improved with the launching of these files, and the company continues to express its dedication to customers as the 3D printing technology develops and evolves. Taiwanese officials have shown great support for 3D printing technology, and in a recent turn of events, the country has decided to dedicate resources over the next two years to ensure more high school age students gain exposure to 3D printing. Fab Trucks — maker labs on wheels — will visit almost 500 high schools throughout Taiwan, reaching 160,000 students and teachers. The Ministry of Education has spent $224K (USD) on the six laboratory trucks equipped with professional 3D printing-related equipment. This equipment includes DLP (light curing) and FDM 3D printers, laser cutters, a CNC milling machine, and additional accessories and materials. Students will be encouraged to use the trucks as much as possible when they are available on their campuses in the hopes that Taiwan and the world will see a new generation of makers and 3D printing innovators on the horizon. The relevance of 3D printing for a growing number of students can also be found in a Fashion Institute of Technology student’s project that used 3D printing to make an elaborate neck and matching dress piece. Rachel Nhan took her class assignment theme “Mad Max Meets the French Court” to heart as she designed a piece that perfectly merges these seemingly disparate themes into one captivating design. After considering 25 different design concepts, Nhan used Autodesk Maya to create the selected model, which was split into 14 pieces and 3D printed by FIT’s PrintFX Lab on a uPrint Stratasys Machine with a 6″ x 8″ x 6″ printing bed. Nhan reports having some difficulty fitting the different components onto the print bed, but you would never know she had any difficulties by looking at the finished product. Capturing the Mad Max/French Court theme quite well, Nhan’s piece is also a reminder of 3D printing’s growing popularity in the fashion design world, as more and more people rely on it to realize their own customized, outlandish, and futuristic fashion visions. While students (like FIT’s Nhan) continue to use 3D printing in a wide variety of applications, teachers are also a standout source of knowledge and innovation in the 3D printing scene. Using webcams, a video projector, and other household items, Danish teacher Hesam Hamidi has made a perfectly functional structured light 3D scanner — a scanning device that measures objects’ three-dimensional shapes using a camera system and projected light patterns. This project is called “HHSL3DS” and Hamidi, who has been working in Denmark’s Copenhagen Fablab for some time, shared all of his designs and even the software and code he has written for it online. You can find entire tutorial, as well as all the downloadable files, on Instructables. For those who get excited about the merging of culinary arts and 3D printing technology, good news: the world’s first 3D printed food conference will take place in Venlo, the Netherlands on April 21, 2015. This conference promises to bring printed food from “hype to reality,” while addressing important questions such as: “Which industries will be influenced by the technology?” “Which food components can be printed in the near future?” “Which aspects should be taken into account to ensure safety and maintainability of 3D printed food?” Also, topics to be explored, which are also listed on the official conference website, include: food components (protein, carbohydrates, and fats); custom nutrition; food processing and design; safety issues; new value chains; applications for the elderly and the health care industry; hardware and software developments; business models and legal issues. There’s still time to register on the conference website if you are in that growing group of 3D printed food fans! That covers all the stories we missed this week! Let us know what you think of them in the Stories We Didn’t Cover forum thread at 3DPB.com.